Various PSUs have recently released the notification for recruitment to various posts.This is certainly great news for all the aspirants owing to the well-reputed jo0b and the lucrative pay scale. This article will bring forth all the details pertaining to PSUs recruitment such as Opening and Closing Registration Dates, Eligible Streams, Job Profile Details and Pay Scale. Subscribe for latest news, tips and free tutorials at your personal email id. 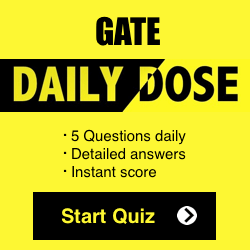 Expert Tips and Tutorials to crack GATE 2018 Exam. Here, we are providing Company-wise details of the Job Profile, Salary Details, etc. Selected Candidates would be placed in the ‘Group A’ and the pay scale would range between Rs. 24,900 – Rs. 50,500. In addition, various allowances such as Dearness Allowance, HRA would also be paid. The total remuneration at the entry level for the Management Trainees are currently 10.5 lakhs per annum. Candidates must possess a full-time regular B.E./B. Tech degree in Mechanical or Chemical Engineering from any recognized Indian University. Minimum qualifying percentage in Graduation is 60% for the General and OBC Category candidates and 50% for SC/ST/PWD. 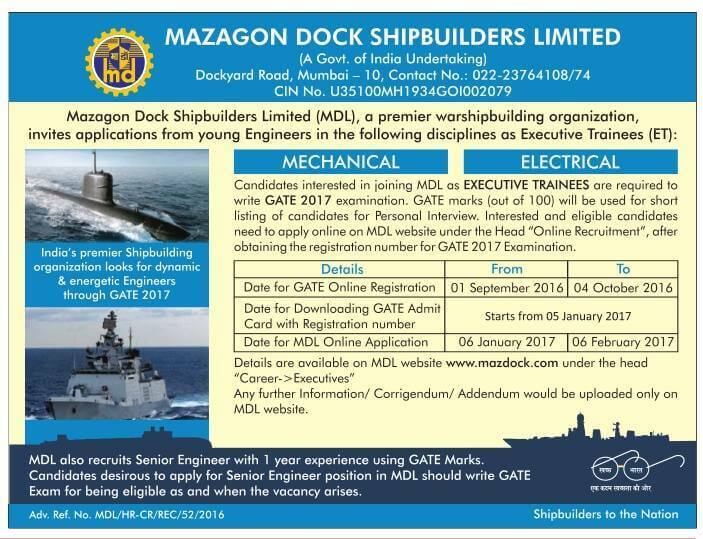 MDL has released the recruitment for the post of Executive Trainee (Mechanical/Electrical). The online registration for MDL recruitment will commence from 6th January 2017 and the last date of online registration is 6th February 2017. The pay scale for the Executive Trainee post would range between Rs. 16,400 and Rs. 40,500. 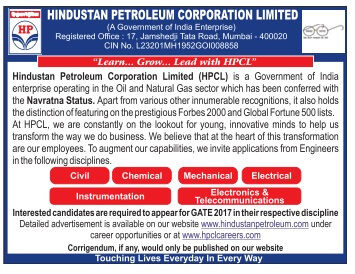 HPCL has released recruitment to the post of Graduate Engineers. Selected candidates will be offered pay scale ranging between Rs. 24,900 – Rs. 50,500. The online registrations would commence from 10th January 2017 and the closing date for Online Registrations is 10th February 2017. Candidates belonging to EC, ME, EE, IN and CH are eligible to apply for this recruitment. BSNL has recently released the notification for recruitment to 2,510 posts of Junior Telecom Officer (JTO). The pay scale of the selected candidates would range between Rs. 16,400 and Rs. 40,500. The candidates would be selected based on their valid GATE 2017 score. Online Registrations would commence from 1st January 2017 and the closing date of Online Registrations is 31st January 2017. 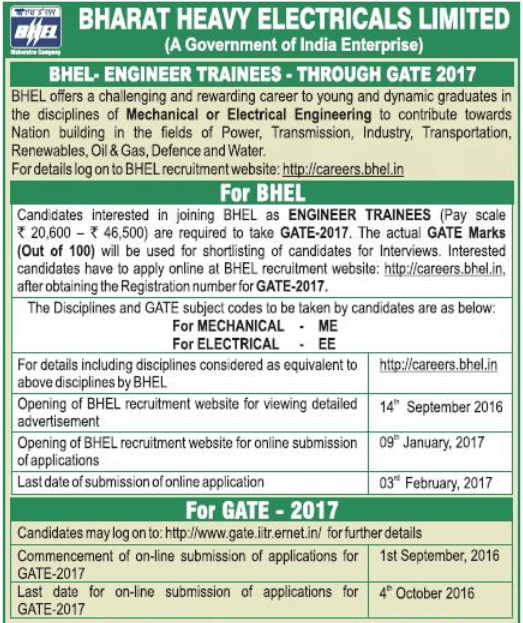 BHEL has recently released the notification for recruitment to Engineer Trainee posts. Selection criteria would be the marks secured in GATE 2017. Selected Candidates would be entitled to a pay scale ranging between Rs. 20,600 and Rs. 46,500. Online Registrations would commence from January 9, 2017 and closing date of Online Registration is February 3, 2017. There are 58 vacancies in Electrical Engineering and 38 Vacancies in Civil Engineering. Selected candidates would be entitled to a pay scale ranging between Rs. 15,600 and Rs. 39,100 and a Grade Pay of Rs. 5400. Online registrations would commence from January 5, 2017. Online Registrations would commence from January 2017 and closing date would be in March 2017. Selected Candidates would be entitled to a pay scale ranging between Rs. 24,900 and Rs. 50,500. Total Annual pay scale during training period would be Rs. 8.15 lakhs and Post Training would be Rs. 14.44 lakhs. DRDO has recently released notification for recruitment to Scientist/Engineer ‘B’ posts. The pay scale of the selected candidates would range between Rs. 15,600 and Rs. 39,100 with a Grade Pay of Rs. 5400. The Application Fees for the General/OBC candidates is Rs. 100 and SC/ST/PWD/Women candidates are exempted from fees. Online Registrations will commence from 5th January 2017 and the closing date for Online Registrations is 4th February 2017. Candidates will be first short-listed based on their GATE 2016 score and will then be assessed based on their performance in Group Discussion (GD) and Interview. Selected candidates will receive a Basic Pay of Rs. 24,900 per month and an Annual CTC of Rs. 11.25 lakhs per annum. CS, ME, EE, EC, IN, Petroleum, Metallurgy, Civil, CE are the eligible streams. 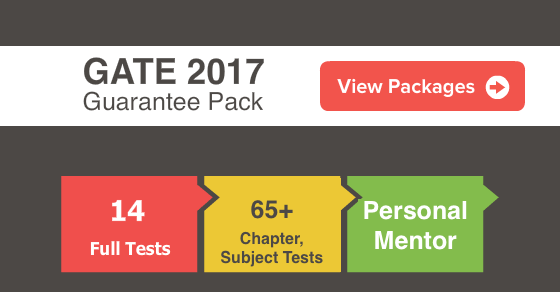 For candidates belonging to General and OBC category, eligibility criteria is minimum 65% marks in B. Tech and qualifying criteria is minimum 55% marks for SC/ST/PWD candidates. 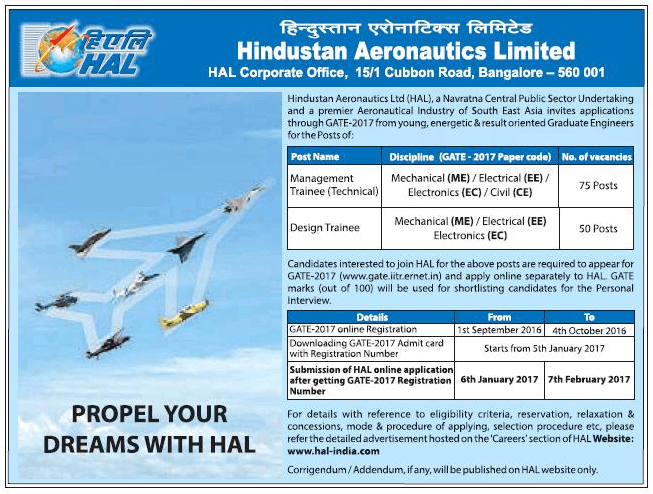 HAL has recently released the notification for recruitment to 125 posts of Management Trainee/Design Trainee. The online registrations will commence from 6th January 2017 and the Closing Date of Online Registrations is 7th February 2017. Selected candidates would receive a Pay scale ranging between Rs. 16,400 and Rs. 40, 500. Final selection will be conducted based on performance in Group Discussion and Interview. 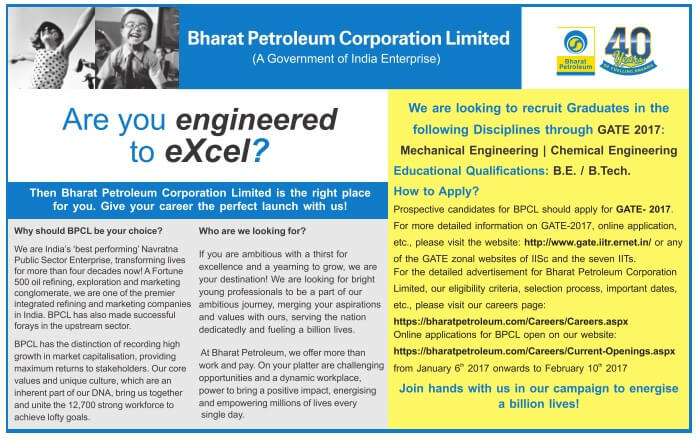 BEML has recently released the notification for recruitment to Management Trainee posts. Online registrations would commence from 10th January 2017 and the closing date of Online Registrations is 31st January 2017. Selected candidates will receive a pay scale ranging between Rs. 24,900 and Rs. 50,500. Application Fee: General/OBC Category candidates will be required to ssubmit an application fee of Rs. 500 through SBI challan while there will be no fee for SC/ST/PWD candidates. NLC has recently released the notification for recruitment to ‘Graduate Engineer’ posts. Selected Candidates will receive a pay scale ranging between Rs. 20,600 and Rs. 46, 500 with IDA pattern of 3%. Selected Candidates will receive a CTC of Rs. 8.90 lakhs per annum. 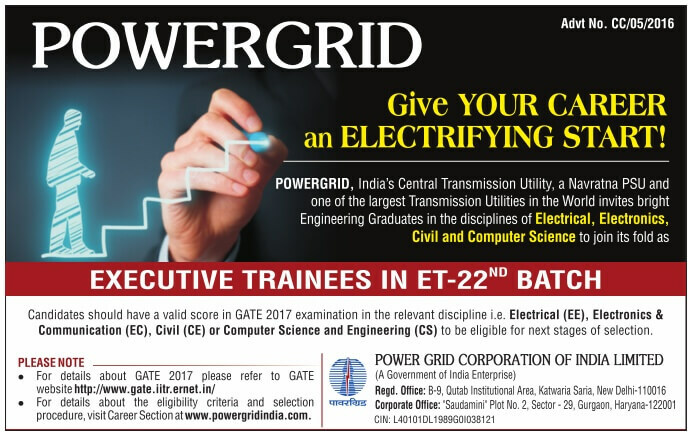 NTPC has recently released the notification for recruitment to Executive Trainee posts. Selected candidates will receive a pay scale ranging between Rs. 24,900 and Rs. 50, 500. BBNL has recently released notification for recruitment. In selection, 75% of the weight age will be given to the Normalized GATE 2017 score and 25% of the Weight age will be given to Interview. Interview is likely to be conducted in the month of May-June 2017. Online Registrations will commence from March 2017. Selected candidates will have to undergo one-year Induction Training. Selected candidates will receive a pay scale ranging between Rs. 15,600 and Rs. 39, 100 and a Grade Pay of Rs. 5400. MIDHANI has recently released the notification for recruitment to 15 Management Trainee posts. Online Registrations will be tentatively commence from April 2017. The upper Age limit for registration is 30 years. The Pay Scale would range between Rs. 16,400 and Rs. 40,500 with IDA pattern of 3%. Candidates must have secured minimum 60% marks in ME/EE/Metallurgical Engineering. Selected candidates will be on a training period of 2 months. After completion of training, candidates will be recruited to the post of ‘Assistant Manager’ and will receive pay scale in the range of Rs. 20,600 and Rs. 46, 500 on probation for a span of 2 years and will be entitled to other allowances as well. 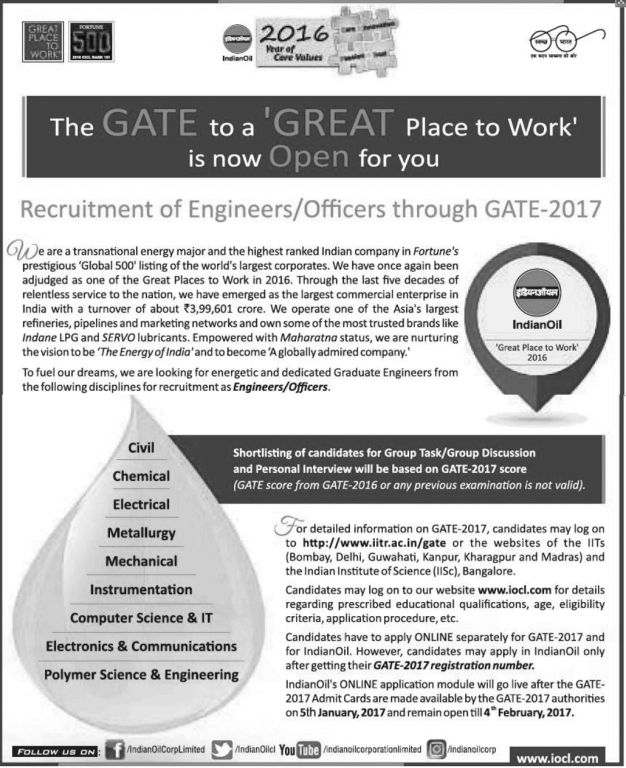 Oil India Limited has recently released notification for recruitment to Executive Trainee posts through GATE 2017. Selected Executive Trainees will receive a fixed stipend of Rs. 25,000/- per month. Other benefits apart from the stipend include free medical facilities for self and free hostel type accommodation on sharing basis. Executive Trainees will have to undergo minimum of 1 year tyraining after which they will be assessed for absorption into the Regular Executive Grade B cadre. 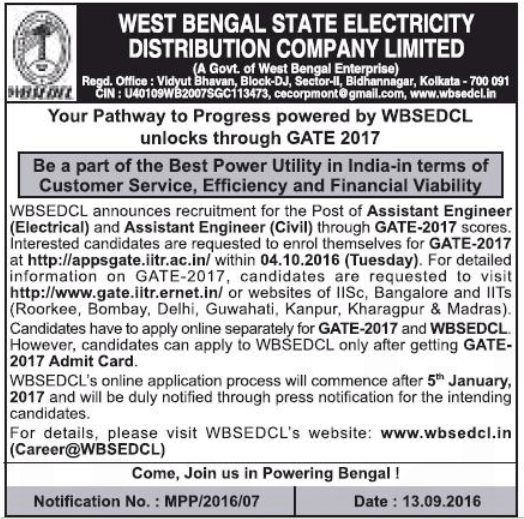 PSPCL has announced recruitment to the post of Assistant Engineer (On training). Online registrations will commence in April 2017. NHAI has released recruitment to the posts of Deputy Manager (Technical) and Deputy Manager (IT). Registration will open in Mid of April 2017. Haryana Power Utilities invites applications to the posts of Junior Engineer in different disciplines. Registration will commence in April 2017. We hope that this information will prove useful to the aspirants. Enroll in Mentor Program and Avail your Personalized Mentor for GATE 2017 Preparation and Doubts Clarification! What aspirants need is the right approach along with concrete strategies to reach their goals. GATE GUARANTEE PACK has been the choice of successful GATE toppers all over India. It is the perfect online tool to check your level of preparedness among st students preparing all over the country where you study under guidance of mentors. To stay updated, enter your details! You have successfully subscribed to our mailing list.